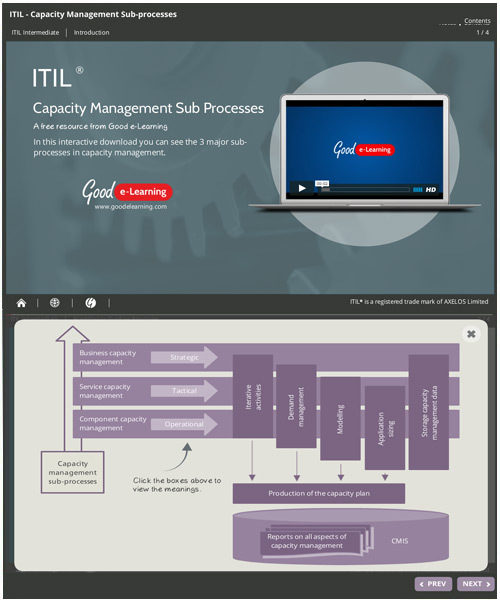 In this ITIL interactive guide we take a look at the 3 major sub-processes in capacity management. Capacity management is an extremely technical, complex and demanding process, and in order to achieve results, it requires three supporting sub-processes: business capacity management, service capacity management and component capacity management. There are many similar activities that are performed by each of the above sub-processes, but each sub-process has a very different focus. Business capacity management is focused on the current and future business requirements, while service capacity management is focused on the delivery of the existing services that support the business, and component capacity management is focused on the IT infrastructure that underpins service provision. The role that each of these sub-processes plays in the overall process, the production of the capacity plan and the storage of capacity-related data is illustrated here. You might also be interested in the following ITIL poster: SLA/OLA/UC. Download this exclusive ITIL poster today to understand how the relationship for the SLA is between Business and Service Provider and how this can benefit you and your organization.